Since the early 2000s, the apparent explosion of interest in Volkswagens with original paint, rust and patina has inspired a generation of car fanatics, who might not be able to afford to restore a car to show condition, but still want a good looking, cool car that will stand out from the crowd. Once looked upon as vehicles that were in need of restoration, cars with original paint, rust and patina, especially within the global Volkswagen community, have gradually become far more popular than restored cars. When walking down a line of cars at a car show, it’s easy to see why; these cars are rare, unspoiled survivors – cars that tell a story of an interesting and varied past. The generation it initially inspired has grown with the hobby, and produced a micro-industry that still manages to embrace the ‘Built not bought’ ethos. 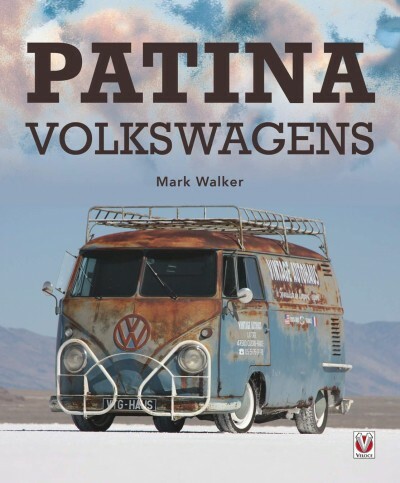 Patina Volkswagens, superbly illustrated with stunning colour photographs, takes an inside look at some of the key car builders, dealers, celebrities and hobbyists, as well as the different styles of build, meaning every single car has a style all of its own. This book is published by Veloce Publishing Ltd, 28,98 Euro – now available at Amazon . This entry was posted in Buch and tagged Auto, Buch, Design, Lifestyle by Franz Veron. Bookmark the permalink.